Ayam Bekisar hybrid are hybrids chicken. 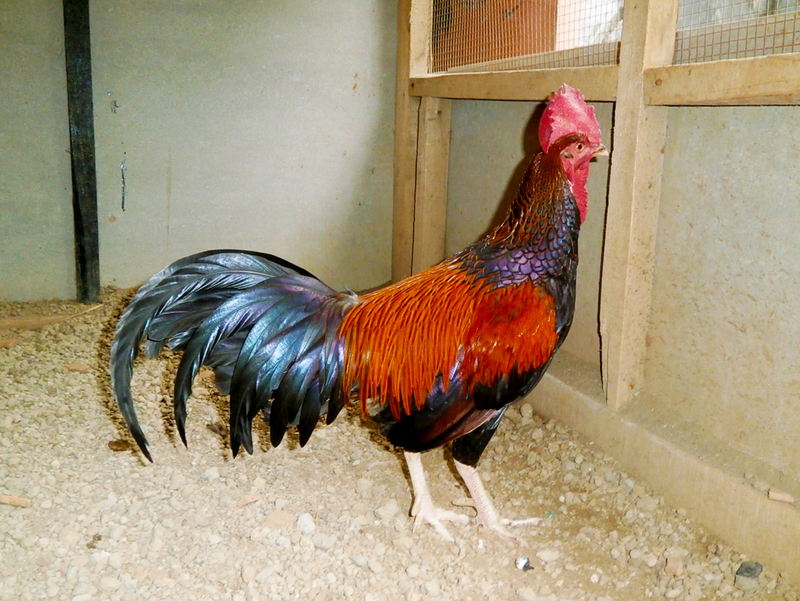 They are an F 1 (first generation) Hybrid between a Green Jungle Fowl male and domestic breed female. The hybrid is originated from Madura Island in East Java, Indonesia. The males were traditionally used to help people to keep in touch with each other when they were out at sea on outrigger canoes. Because the calls are so clear, loud and distinct, the sound can travel across long distances and so each boat had its own adult cockerel, often kept in a wicker cage. The Ayam Bekisar is kept as a pet birds as we know the birds has beautiful color and singing loud sound. Dominant feathers pattern is got from their mother. And their body shape, voice and characteristic also their glossy feathers is got from their father the Green Jungle fowl. Hybrids are always sterile for the female but not for the male, so they cannot be breed as pure breed. We can only cross back or mix them with other chicken breed to get new breed, and its will be unstable breed. There is many Indonesian breeders work for cross back the bekisar with many kind of chicken breed and we never know the result cause this new breed line was unstable. we can only create till F 2 as a 3rd generation of hybrid from Green Jungle fowl. The Green Jungle Fowl is the original wild bird that carries the amazing gene for color variation, so it must have been the great grand father in history. The value of a Ayam Bekisar is based on its voice as well as look like, only the clearest voice of Green Jungle Fowl and clearest voice of domestic breed are use for breeding. Their parents must also be exactly right size and temperament, so that they can happily breed together. Nowadays, artificial insemination and other breeding techniques also being used to increase the population.